A tattoo is something notoriously painful but still ‘Tattoo Lovers‘ love to get them in the skin. Tattoos are temporary or permanent markings in the dermis layer of the skin. Ink or needles are used to make tattoos. Most popular choices of people among Tattoos are shapes, numbers, and alphabets. I’m sharing here the most wanted free tattoo fonts. These tattoo fonts will give you ideas to get a proper tattoo. All windows and Mac users can download these Tattoo fonts. So, if you don’t have any clear idea in your mind about Tattoo, this content will guide you. There are a number of tattoo fonts available on the internet but I chose best of best for you. But keep in mind your tattoo must have the personality that you are seeking for. Choose the more stylish font and hold the tight regards of friends and well-wishers. Are you a Tattoo lover and looking for a “Tattoo Font” to get a “Tattoo Design”? You came to the right place. 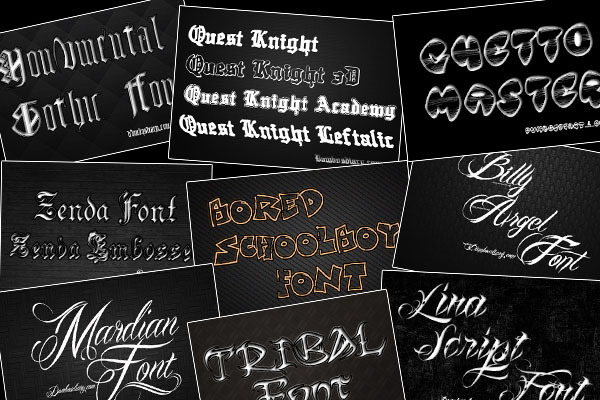 I brought for you a wide collection of free “Tattoo Fonts”. Anyone can download these amazing “Tattoo fonts or Tattoo designs” for free. But remember, these all fonts are for personal use. Don’t use these “Tattoo Fonts” for commercial use. You need to pay a little amount if you want to use them as commercial. Most widely used fonts for Tattoos are “The Script Font”. Graffiti style look amazing in tattoos. Here are best Graffiti Tattoo Fonts for Tattoo Lovers.